It is a simple truth but often overlooked, mostly by dudes who think too little and run their mouths too much. 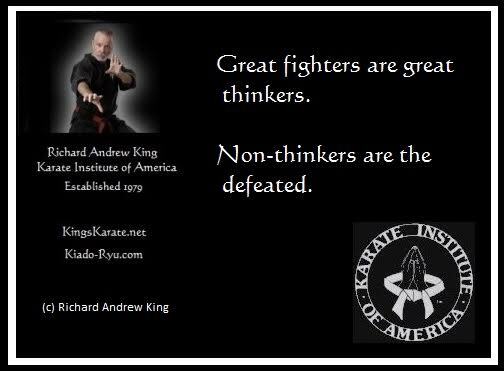 All Karate Institute of America students, especially Black Belts, understand the critical nature of being an intelligent fighter. Yes, one must be tough mentally and strong physically, but the provenance of all great fighters and generals is their intelligence, i.e., their ability to think and execute. Great generals throughout history such as Sun Tzu, Hannibal Barca, Alexander the Great, Leonidas of Sparta, Philip II of Macedon, Julius Caesar, Scipio Africanus, Attila the Hun, Charlemagne, William the Conqueror, Genghis Khan, Frederick the Great, George Washington, Napoleon, the Duke of Wellington, Geronimo, Stonewall Jackson, Robert E. Lee, Ulysses S. Grant, Bernard Montgomery and George S. Patton, Jr. are just a few of those fighters who used their intelligence to win victories and cement themselves as warrior icons of the highest order. To be a great fighter, one must have a functional understanding of strategies and tactics, offenses and defenses, mental and emotional states of being, fighting postures, alignments, distances, size and weight differentials of opponents, guards, angles of attack and retreat, footwork, educated movement, rhythms, timings, false attacks and change. Most of all, great fighters must not only know their opponents but themselves, especially their personal strengths and weaknesses. These are just a sampling of what any great fighter knows and what prospective fighters should study, thoroughly. Truly, fighting is not for dummies. It is dangerous and deadly. Those who desire to be victorious must become avid thinkers and committed students of martial arts, not simply dudes with an attitude—non-thinkers who become the defeated, not the victorious. Copyright © 2019 Richard Andrew King - License - Powered by Hugo and Hugo-Octopress theme.